I'd like to give a little bit more detail about the last three items. Before 2.0.8, deleted tracks were only removed from the iTunes database, but the actual files remained on the harddrive. 2.0.8 changes this - files are now deleted (or put in the trash/recycling bin). For more info on this and on how to delete files of duplicates that you removed with pre 2.0.8, see this posting. The key notation was switched from sharps to flats, because many users using the Camelot wheel find it easier to refer to keys in this notation. Because the company that came up with the wheel, regards the number code their intellectual property, we can't simply display that number. 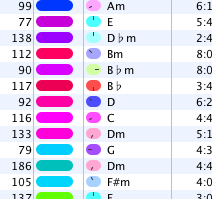 But to make things a little easier, I added a little clock hand to the key color. This hand points in the same direction in which the key would be located on the Camelot wheel, thus making it easier to figure out what keys match harmonically. Much of these enhancements are based on user input (Thank you!) - I really hope this improves the quality and usefulness of the software for harmonic mixing. Thats a pitty with not being able to support the camelot notation. However I have another idea for our wheel support. How about optionally allowing the clock to be used as the album art or in order to keep album art, simply add the clock icon in the lower right corner of the existing album art. One more thing. If would be nice if optionally I could also write into the key field. Then I could update the value manually to be written in the format I want. OK another feature I like in MIK is that I can optionally also write the key at the beginning of the comment. This way I can also see the comment in iTunes. More importantly, if I use a DJ app like Traktor, I can only show a limited number of fields, and this way I can combine two fields.